I call my Le Creuset dutch oven my "happy pot" and am always looking for and concocting new recipes to make in it. 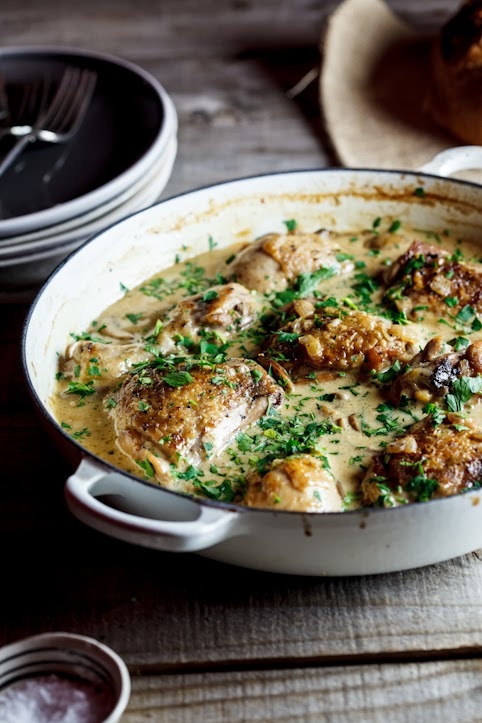 So, I was excited when I saw this wonderful dish posted by Simply Delicious for Coq Au Riesling from Nigel Slater. It's definitely on my list for this weekend ... wonderful Sunday dinner idea! I will substitute either greek yogurt or low fat sour cream for the cream in this recipe to make it lighter. I find Black Forest Ham to be a nice substitute and sometimes even prefer it to bacon or pancetta. Adds a nice smokey, maple flavor. I'll use sweet onion instead of regular brown onions ... they are wonderful when cooked in the olive oil and I find them to be less pungent. Click here to see the recipe. If you have Paprika and would like me to send you the recipe to download, please email me.